Top right (high effort, high impact): These are major projects. They will move the needle for users, but you should make sure you do all the discovery work necessary to understand the problem thoroughly and to get the details right since the cost is also high. Top left (low effort, high impact): The projects can be quick wins. They can even be good candidates for early experimentation if the effort is low enough. Lower right (high effort, low impact): These project are time wasters. Avoid doing these at all. Lower left (low effort, low impact): These are the maybes. Don't spend time here if there are quick wins that can be addressed. However, sometimes multiple maybes, when taken together, can lead to a great user experiences. Use Impact vs. Effort when your team doesn't feel the need to differentiate between reach and impact (as done in RICE), or have a variable for confidence. Note that by not including confidence, you are vulnerable to the tendencies to overestimate impact and underestimate effort. See this article by former Google PM Itamar Gilad for more information about the risks of using this scoring mechanism alone. 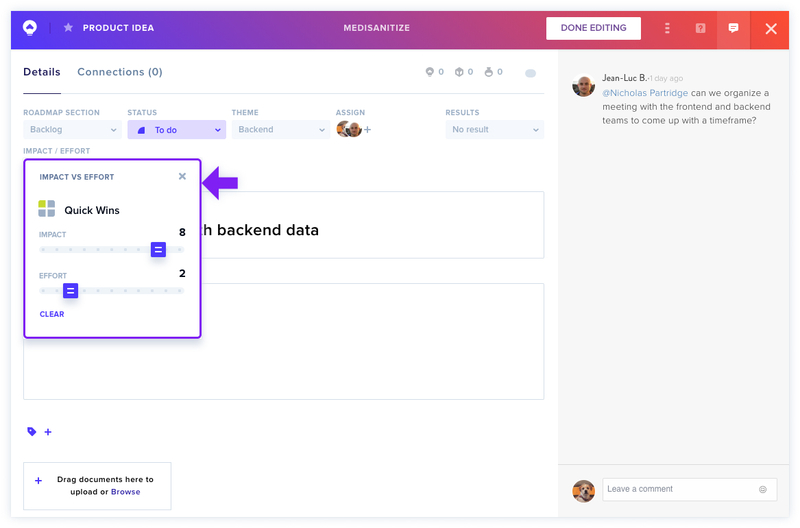 Once you've set up Product Scoring, you can assign scores to your Ideas either from within an Idea card, or in-line in List View. Impact vs Effort scores are designed to be easy to change by dragging the sliders to your desired value. This will automatically categorize your Idea as one of the four quadrants. You can filter by Product Score while in List View, by selecting the Impact vs Effort filter and selecting the quadrants you'd like to see. For example, if you wanted to see all Quick Wins in order to prioritize them higher, or to move Time Wasters into the Backlog. 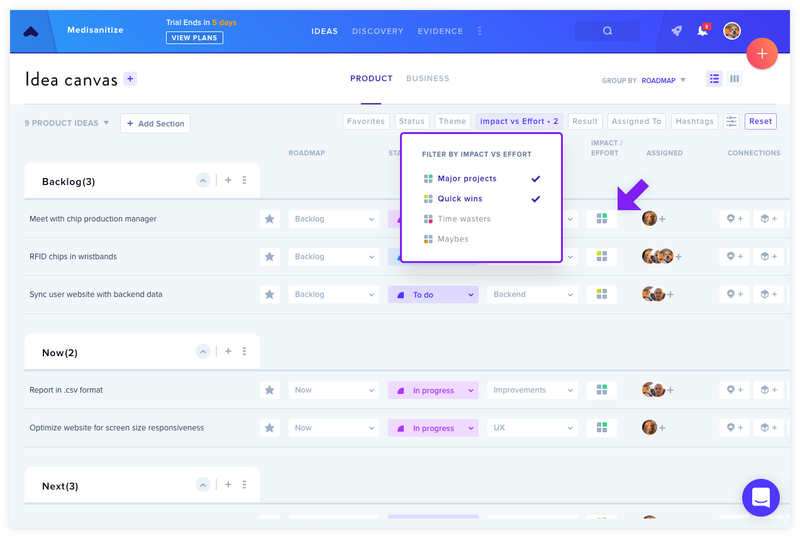 To set up your scoring options, navigate to Team Settings, then Product Ideas. 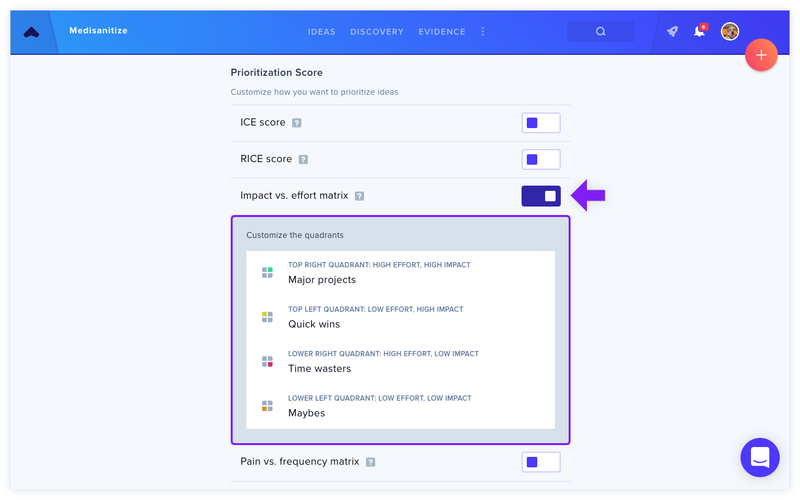 At the bottom of the page, you'll be able to turn Impact vs Effort scoring on and off, along with the other scoring options. Once you've enabled Impact vs Effort scoring, you'll find it in your Idea cards and in List View.